Minister of Economy confirmed that nuclear power plants will continue to create a solid ground in Slovak electricity production. It is an important element for security of supplies and sustainable development. He also underlined the importance of building and developing energy infrastructure in Slovakia. At the International Conference Secure Energy Supply (SES 2012) he also mentioned that renewables are considered to be a complement source. Both types of energy sources will be developed. He also confirmed that biomass has the biggest potential for development in Slovakia. Last year the various renewables contributed less than 11 % to the electricity production. Large hydroelectric plants produced above 14 %, thermal plants above 20 % and nuclear power plants (NPPs) more than 55 % of electricity. 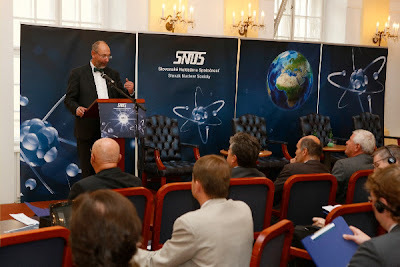 The economy minister also talked about new nuclear source which is supposed to be built in Jaslovske Bohunice. Initial plans were to build it until 2020 but Malatinsky sees 2025 as the earliest possible date. Nuclear energy company of Slovakia (JESS) is currently finalizing a feasibility study. The new NPP is supposed to be located on the same grounds as old bloc V1 that is being decommissioned. The project anticipated a construction of pressurized water reactor (PWR) with installed capacity of 1000 – 1700 megawatts and life expectancy of at least 60 years. However, any decisions on size or type will depend on the feasibility results. Initial costs for the new nuclear source were estimated at 4 - 6 billion of euro. No public finance is expected to be used.